These shots were taken on Monday. You know, it was a perfect evening. Warm golden light was spilling over the foothills West of Cochrane. Only minutes from the town border. Only minutes from where I live! As soon as the sun went under the horizon and I saw the clouds catching that pink glow I knew I had a winner (or multiple winners). I made a few different compositions of these scenes. These ones worked best I thought. I really like all those yellow and brown colours in this shot and how they complement the sky tones. It's been a long time since I was able to shoot a decent sunset. I love shooting close to home. Mainly because I know exactly where to go under certain conditions. But I have to confess, it took me a fair while to understand and learn how I could appreciate these hills. 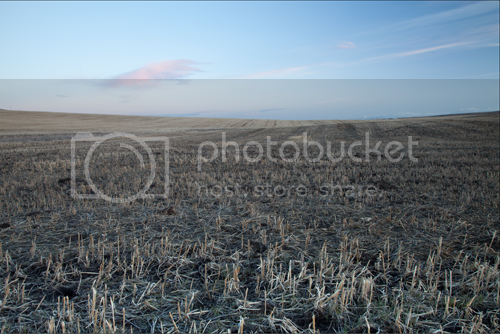 In the coming months I'll do a lot more of these prairie shots. 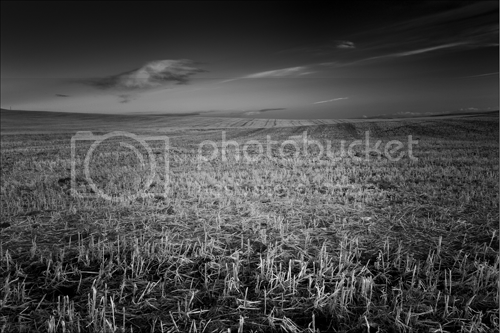 If you can shoot the prairies and the foothills, you can tackle everything I think! These were simple 'in camera' shots. I recently purchased a Lee polarizer (ouch, that left a hole in my wallet) and a Lee 2 stop Soft ND grad. Both were used in this shot. This saved me some time on the Mac. Ask my wife how pumped I was when I got home, that I nailed these in camera! Today it's been 5 months since I've started my Twitter journey. You know in the beginning I was very skeptical that this would do much for my photography. It turned out that it is making a huge difference. Not only am I tweeting with my heros in landscape photography but they are giving me sincere feedback and tips on how to become better at it. And by the way it is so much fun to do! Who would have guessed that after just 5 months tweeting I would have 434 people (most of them are fellow artists and photographers) following my stuff online (as of today, April 22nd at 5pm). That blows my mind! Here is the thing, I am going to do a little competition! Whoever is my 500rd follower PERSON who follows me on Twitter, will get a free 11x17 11x14 print (being in the printing industry screwed up my scenes of paper sizes) of choice! If the 500rd person is in fact an organization, website, or other than a person, the print will go to the next follower. Just me saying 'thank you' to you all for the support you've been giving me on this social platform. If you are already on Twitter maybe you can help me out. I would appreciate if you would retweet this simple message. Thank you all so much! Yesterday – while shooting a nice Chinook arched sunset – my Gitzo tripod decided to call it quits. After using it for about 8 months this thing is done. I did nothing special, I'm not trowing this thing around nor did I put too much weight or strain on it or anything silly like that. But yesterday, one of the 'ledges' – where the tripod legs snap into – broke right off. When I bought it last July, I thought I was crazy spending that much cash on a stupid tripod. And now I feel very disappointed by the quality of Gitzo. Wasn't Gitzo a company with a big reputation amongst the pro community? I was researching my tripods default yesterday when I came across a post on some message board where somebody was explaining and showing the SAME EXACT problem (I'm using the treads photo to show you what went wrong)! This must be a manufacturing default. I'll run by my new friends at The Camera Store this afternoon and see what they say. Alright. So I dropped the tripod of at The Camera Store and hopefully it will not take too long to get this fixed. Thanks again Jim for taking care of this! And hopefully by the end of the week I'll have a loaner I could use. Otherwise shooting landscapes without a tripod will be a challenge for the next weeks.